There are options for ensuring just about everyone can get up and ski. Taking people skiing for the first time can be a frustrating experience for all involved. Many first-timers have a difficult time getting up with regular skis and can quickly be demoralized if they can’t get up. Plus, quality skiing time is cut short by the endless launch, crash, launch, crash, repeat cycle of failed attempts. Fortunately, there are devices on the market you can add to your arsenal that will pretty much guarantee success … for everyone. A couple of years ago, a product called the ZUP YouGotThis hit the market. It solved a number of barriers to skiing success and created an entirely new genre of watersports in the process. This year a more refined version — the DoMore — takes the concept to a new level. 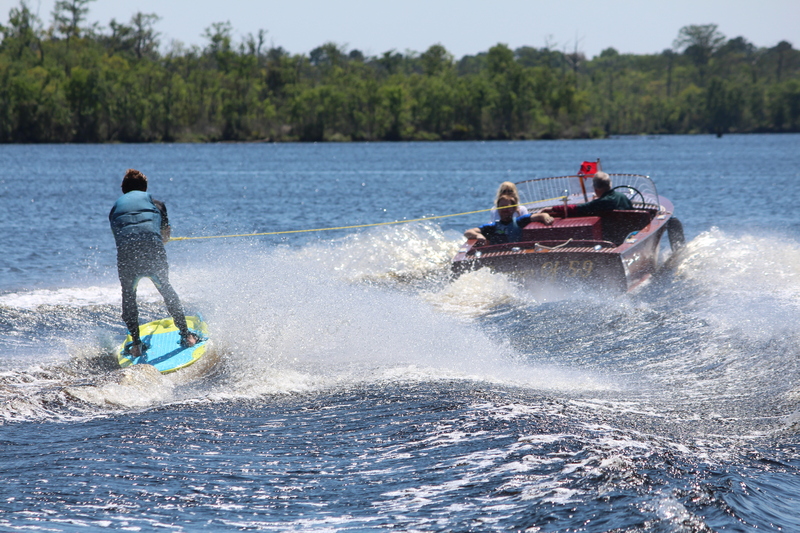 During a recent outing on the Ortega River in Jacksonville, Fla., we got a chance to see both ZUP boards (zup.com) in action with riders who had never ridden one before. Towing our riders was Alan Wright’s Summer of ’59, a lovingly restored 1959 Chris-Craft 17 Ski Boat, the builder’s first-ever dedicated watersports boat. The greatest obstacle for young or inexperienced skiers trying to get up are the first three seconds of the “ride.” Many of them lack the balance or the up per body strength to hang on during launch. Both ZUP boards have solved this problem with a shallow, integrated hook on the front of the board. It holds the handle and takes the strain of the pull during launch. The first of our riders, Ford Brodeur (and later Kent Zeigler), placed the DoubleZUP handle in the hook and signaled he was ready. With a satisfying rumble from the through-hull exhaust, the Chrysler 283 V-8 gently pulled the board on plane as Brodeur hung on to the large, ergonomically correct side handles and laid flat on the fully padded board with his head up. At around 18 mph, Brodeur transitioned to his knees, which were cushioned by neoprene footrests that also serve as elbow rests when the rider is lying down. Grabbing the topmost of the two parallel handgrips on the DoubleZ UP handle, to prevent pinching his fingers on the lower handle, which was connected to the hook, Brodeur pulled back a bit to release it. 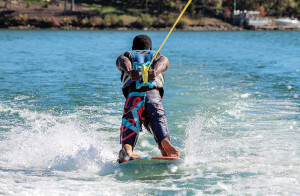 After making a few cuts kneeboard-style and getting the feel of it, he put one foot on top of the board, then the other, and stood up … first time’s the charm. After sliding his feet into the open-backed bindings, he was ready for some standup riding, complete with crisp cuts and wake jumping. The board’s top padding also has enough grip so you can ride with your feet free of the bindings, surfboard style, if you like. Going to the standup position is where the difference in the two boards really shows up. The original YouGotThis board ($279) is roto-molded, weighs 16.5 pounds, is designed for beginning to intermediate riders and is very stable when cutting from side to side. 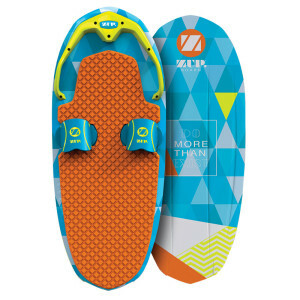 The DoMore ($379) is a compression-molded board, just like high-end wakeboards, weighs 12.8 pounds, and is about four inches narrower and an inch and a half thinner, at three and a half inches. Although the DoMore is less buoyant, it’s more maneuverable for cutting, jumping and even doing 360s. 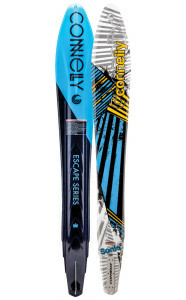 Competition slalom skis are the racecars of skis, purpose-built to allow skiers to run a buoy course. But beca use they have very narrow tails, they are really difficult for the average skier to use during deep-water starts. The lack of lift requires a fair amount of muscle to get on plane. Connelly (connellyskis.com) has been making skis for 50 years and used that experience to create the Sonic, which is designed for the recreational skier and has a wide nose and tail to make it very easy for even first-timers to get up. But just because it’s beginner-friendly doesn’t mean it’s a boring ride. It also has some high-tech features that will appeal to the advanced skier who’s just looking for a relaxed free ride but still wants to be able to turn quickly and throw up a satisfying wall of spray. Think of it as a sports car instead of a racecar. The Sonic ($280, bindings are extra) is 65 inches long, and in addition to being extra wide, it has hook grooves, similar to the hard chines on a boat, and an aluminum skeg to give it traction during turns. It also has V-step technology in the tunnel to reduce drag, and it flexes more than competition skis, for a comfortable ride. So next time you have beginners on board, don’t automatically start inflating a tube … take them skiing instead.